Our 125mm enamelled pipe connects your stove to your flue outlet. These 1000mm length enamelled pipes are made from 0.12mm thick zero carbon steel and they feature two coats of Class A quality enamel. All of the components have been designed to be installed, quickly, safely, and simply. Our 125mm enamelled pipes are 1000mm long and they are suitable for gas, oil, and solid fuel appliances with temperatures up to 750°C. These enamelled stove pipes should only be used as a connecting pipe between your appliance and flue liner, chimney stack, or your twin wall flue system. These black stove pipes should not be used to pass through ceilings or walls. Our 125mm enamelled stove pipe is a single skin flue system that is manufactured from 0.12mm zero carbon steel. They also feature a vitreous enamel coating in a matt black finish. These 125mm Eurovit pipes are suitable for gas, oil and solid fuel appliances with temperatures up to 750°C. You should not install a piece of the 125mm black stove pipe within 3 times the diameter of the flue from combustible material. For example, wood, plaster, etc. A 5 inch (125mm) diameter piece of the black stove pipe should be 15 inches (375mm) away from combustible materials. 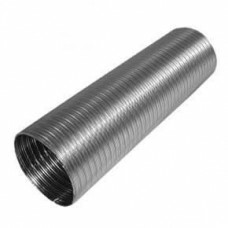 When installing, make sure that the 1000mm long stove pipe is installed the correct way up. The smaller diameter should always be pointing downwards. This is to ensure that the condensates will stay within the flue system and will not pass to the outside of the black stove pipe. Each pipe joint should be coated with a jointing compound (fire cement or high temperature silicone sealant). This is to make sure that no condensate can escape and spoil the appearance of the pipe. 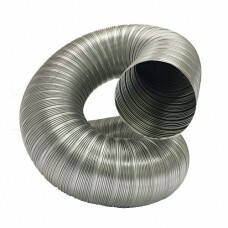 For the maintenance of this 125mm EuroVit pipe, you should make provision for inspecting and cleaning the chimney. This is especially important on solid fuel applications. This can be achieved by installing an enamelled flue pipe with an access door. It is recommended that chimneys serving solid fuel appliances be swept and maintained as frequently as necessary, but at least once a year.